If you’re reading this article, you’re probably on the fence between going for Singer 4411 or it’s older brother, Singer Heavy Duty 4423. I’m here to answer any questions you have about differences between these sewing machines and make you do the right choice. While there is time and place for both of these sewing machines, one clearly comes on top. Both 4411 and 4423 are considered mid-range, entry-level sewing machines. Both of them come with plenty of features to get the most common sewing jobs done without a problem. Both of these sewing machines feature a hard-plastic shell with metal parts inside. This will ensure that your sewing machine will stand the test of time. In other words, in both cases, you will be getting a very high-quality sewing machine both internally and externally. Also, both of these sewing machines have the new and improved singer electric motor that can go up to 1,100 stitches per minute which is faster that Janome and Brother mid-range sewing machines. Another thing we really like about these sewing machines is that they come with a stainless steel bed plate which makes feeding that the fabric will be fed smoothly into the machine. All these three things – the build, motor, and stainless steel bed plate will ensure that stitches you sew will be even, professional looking and high quality. With these included feet, you will be able to do most of the sewing chores. Zipper foot will help you add zippers to whatever you want. Button sewing foot holds the button in place while the sewing machine precisely and firmly sews it into place. This comes in handy when you’re in a hurry and a button pops out. A literal life saver, if you ask me. You will use the all-purpose foot for the majority of sewing chores, that’s your workhorse. Both singer 4411 and 4423 have two levels of presser feet pressure depending on how thick of a material you’re sewing, which is great. Both of these machines come with drop-in bobbin for fast and easy access and a clear window so you can monitor how much thread you have left and never run out at inappropriate times. One of the things that set the 4423 miles apart from 4411 is the automatic needle threading function that Singer 4411 lacks. The feature makes setting up for sewing that much more easier and faster simply because it takes out extra steps you’d do with a sewing machine that doesn’t have this feature. Basically, it’s a game-changing feature that threads the sewing machine needle for you. If you have problems with vision or fingers, this is a no-brainer. You will be thankful for this feature every time you use it. Another reason we suggest going with Singer 4423 is the extra amount of stitches it comes with. While 4411 model comes with only 11 stitches, if you choose to go the slightly more expensive route and buy 4423, you will have 23 different stitches. 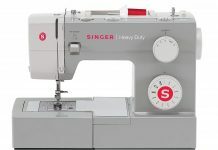 Also, Singer 4423 comes with 4 stitches that are specifically designed to work with knit fabrics which is a huge plus in my opinion. These stitches can also be used with woven fabrics. Another huge bonus stitch-wise is that 4423 comes with 12 decorative stitches. That might not seem like much ( the 4411 model has only 4) but when combined with stitchs length and width adjustment, you can come up with some truly unique and cool stitch designs. We already talked about buttonholes, but this is also an are where Singer 4423 is superior. The cheaper 4411 model uses 4-step buttonhole which is an ancient method, to be honest. 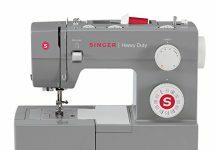 More modern sewing machines like singer 4423 use a 1-step buttonhole. All you have to do is place your button in the included buttonhole feet and press a button. Your sewing machine takes care of the rest. Which sewing machine should you buy? If you’re new to the hobby, the singer 4411 might seem enough feature-wise, but let’s talk about price. 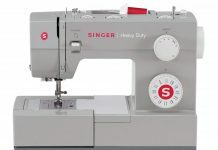 The 4423 model is just about $15-$20 more than the 4411 and comes with tons of extra features so unless you desperately need to save 20 bucks, we can’t justify buying Signer 4411 sewing machine. Even if you’re the ultimate beginner, the 4423 will come with those extra features that will allow you to grow in the hobby. We’ve found that lots of other reviews justify going for 4411 if you’re new and don’t need the extra features, but it’s such an insignificant price difference and the 4423 is on sale often enough for you to grab the deal. Either way, you will be getting a high-quality sewing machine that makes a professional looking stitch and will last you a long time. Both of these sewing machines can sew multiple layers of fabric and if you practice enough, you will get a similar result with both of these sewing machines.